Team boss Carl Johnson hailed his patched-up Peterborough Panthers heroes as they set up what he believes will be a ‘classic’ SGB Championship KO Cup final. 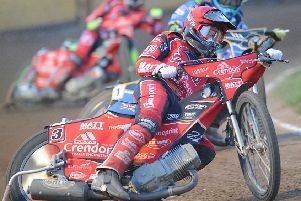 The city side will take on East Anglian rivals Ipswich in a two-legged trophy shoot-out after dumping out holders Glasgow thanks to a 95-85 semi-final triumph on aggregate. Panthers were victorious 50-40 in the first leg last Sunday (October 15) and then battled to a 45-45 draw as the return clash finally went ahead at the third attempt last night (October 20). And that terrific showing on Scottish shale came despite Johnson only being able to call on four of his regular riders - with number one Jack Holder joining Bradley Wilson-Dean in being laid low by illness, and reserve Tom Bacon having seen his season cut short by shoulder surgery. Former GP star Chris Harris produced a sparkling 15-point haul to spearhead the Panthers challenge at the Peugeot Ashfield Stadium. Captain Ulrich Ostergaard, middle-order man Paul Starke and reserve Simon Lambert also made valuable contributions. And guest Mason Campton, who stepped in for Wilson-Dean, produced a notable effort when keeping Glasgow number one Richard Lawson at the back in a shared heat 13 to leave Panthers on the brink of glory which was secured by a 5-1 from Ostergaard and Lambert in the penultimate race moments later. “I could not be more proud of the boys,” said Johnson. “We were excellent across both legs and reaching the KO Cup final is no more than we deserve. “We could have just downed tools when it was clear we weren’t going to reach the play-offs, but the boys have ridden brilliantly in the last few weeks. “We won our final seven league meetings to show everyone how good we can be - and we’ve done the same in this competition as well. “But now the work really begins and we will be doing everything we can to make sure the season ends on a massive high. The opening five races all ended in deadlock at Glasgow last night with Panthers providing the first four winners. Two of those triumphs came from Harris as the visitors adapted to heavy track conditions, made testing by pre-meeting rain, better than their hosts. They also benefitted from a slice of good fortune when home rider Richie Worrall retired from a 5-1 in the fifth contest - although that only balanced out a similar occurrence for Holder in the sixth heat of the opening leg. Glasgow did edge ahead last night with a Lawson-inspired 4-2 in heat six, but Ostergaard and Starke delivered a super reply with a 5-1 in the next race. That seemed to rattle the hosts who followed up a full house in heat eight with a 4-2 in the ninth contest to narrow the gap on aggregate to six points. But that is as close as they ever got to reeling in Panthers. Ostergaard triumphed in a 4-2 in heat 11 to provide more breathing space before putting the outcome beyond doubt in style in the penultimate heat. Harris then took the flag in a shared finale which ensured a stalemate on the night, but it was Panthers celebrating overall. Johnson added: “We spoke about the importance of picking up points early in the meeting. “It was a terrific performance from the word ‘go’. We made some super starts and that was a huge factor in our success. “Providing the first four heat winners ensured Glasgow were unable to build up any momentum. The longer we kept our aggregate advantage intact, the bigger the job became for them. Panthers swiftly turn their attention to the final and host the opening leg at the East of England Arena tomorrow (October 22, 5pm) ahead of a Thursday (October 26) return in Suffolk. Johnson confirmed Panthers are hopeful number one Holder will be well enough to take his place in the team, but they are less optimistic about Wilson-Dean being healthy enough to return. Jack Parkinson-Blackburn has again been lined up to guest in the number seven berth - just as he has done in the past two home meetings. GLASGOW: Dan Bewley 10, Richard Lawson 9+1, Richie Worrall 9+1, Aaron Summers 8, James Sarjeant (guest) 6+3, Jack Smith 3+1, Ryan MacDonald (did not ride), Rider replacement for Nike Lunna.